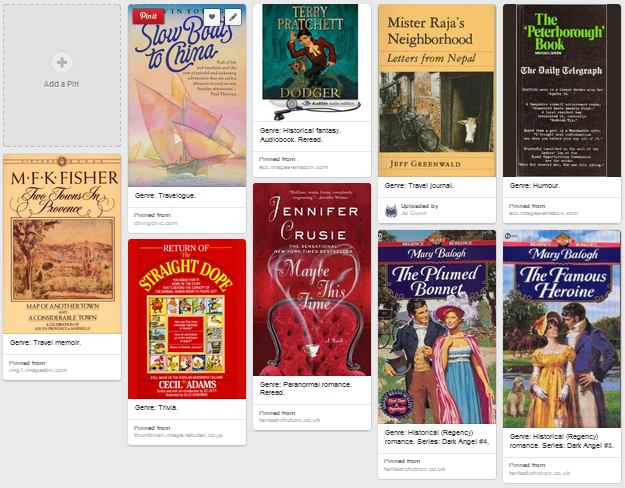 I read nine books in in August: some travel and romance with a peppering of other genres. One was a reread and one was an audio book I had previously read but was listening to for the first time. The first high point was Slow Boats to China by Gavin Young. It’s one of those travel books that makes an appearance on numerous lists of best travelogues, and for good reason: It’s well written, describes a journey that most of us can only fantasise (and occasionally have nightmares) about, and is undoubtedly romantic. It describes the type of journey that can be found in the top ten wish lists of most hard-core travellers of the type who travel for the journey, not the destination. The second high point was Map of Another Town by M.F.K. Fisher. I found it a little disjointed in places, but that did not detract from the joy of Fisher’s prose and her long love letter to Aix-en-Provence. Cecil Adams: Return of the Straight Dope. Trivia. Mary Balogh: The Famous Heroine. Historical romance. Jennifer Crusie: Maybe This Time. Paranormal contemporary romance. Reread. M.F.K. Fisher: Map of Another Town. Travelogue. Michael Green, ed. : The 'Peterborough' Book. Humour. Jeff Greenwald: Mister Raja's Neighbourhood. Travelogue. Balogh Mary: The Plumed Bonnet. Historical romance. Terry Pratchett: Dodger. Alternative reality historical novel; audio book read by Stephen Briggs. Reread. Gavin Young: Slow Boats to China. Travelogue.